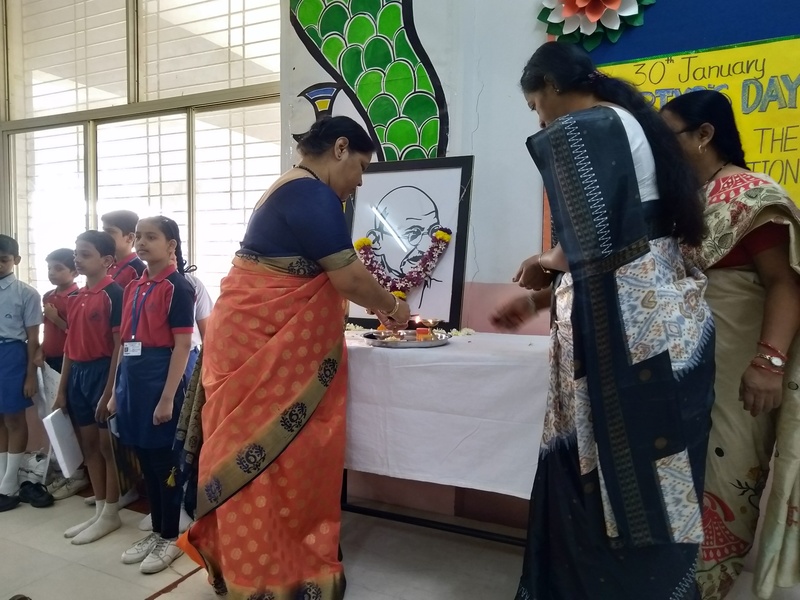 Our S.B.Patil Public School observed Martyr’s Day (Mahatma Gandhi‘s Death Anniversary) at its campus on Monday, the 30th of January 2019. The day was marked by a Special Assembly. Principal of the School, Mrs. Madhubala Gairola, School Co –ordinator Mrs. Padmavati Banda, teachers & students were present on the occasion. The Assembly began by offering homage to the great leader. Principal of the School, Mrs. Madhubala Gairola, School Co-ordinator Mrs. Padmavati Banda offered tributes to the Father of the nation. Student of Std VI A Miss Radhika Nalegave gave a speech about Martyr’s Day. 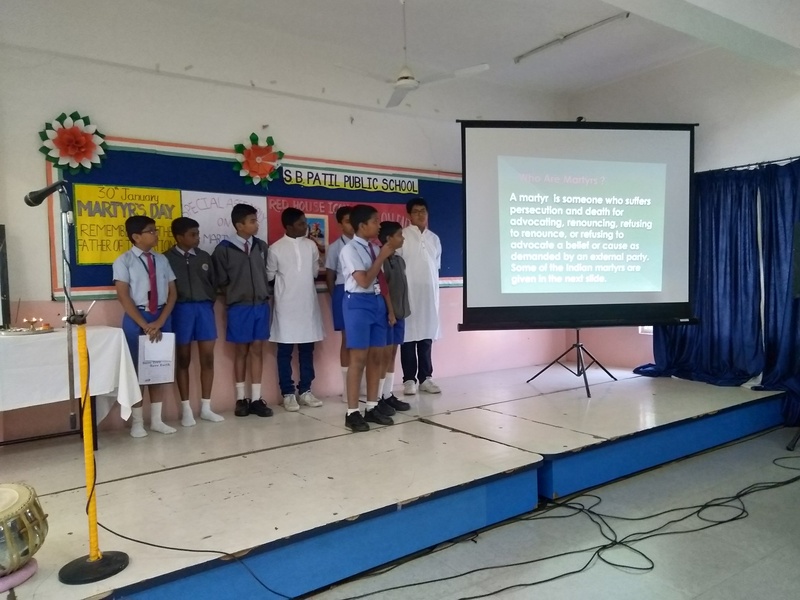 Students of Std VII Master Bryan Binu and Master Nilay Nandimath elaborated about the concept of a martyr and the various great martyrs of our nation; by means of an A- V presentation. Music Teacher Mrs. Sulochana Pawar guided the Choir Group, who presented the famous devotional song, wording –“De Di Humey Aazadi”. Principal Mrs. Gairola addressed the students about need to imbibe the values & great deeds which the lives of great people teach us .She stressed on the fact that it is not muscle power – but strong will power that makes us successful. Also the journey of life becomes easy, if we imbibe in ourselves the virtue of forgiving others, which is the attribute of strong people again. Success will come to us only if we believe in our own self – otherwise we can never attain it – even if we go through the roughest times –because we have already embraced defeat in our minds at the onset itself. Principal Mrs. Madhubala Gairola guided the proceedings of the event. School Co- ordinator Mrs. Padmavati Banda organized the proceedings of the day. C.C.A. – in – Charge, Miss Swaleha Mujawar, Mrs. Geetanjali Zambre, Mrs. Sakshi Shinde & Mrs. Sulochana Pawar conducted the Special Assembly for the day. Our S.B.PATIL PUBLIC SCHOOL observed Founder’s Day (Shankarrao Bajirao Patil Punyatithi) at its Campus on Wednesday, the 14th of September 2018. Principal Dr. Mrs. Madhubala Gairola, School Co-ordinator Mrs. Padmavati Banda, Co – ordinator of Pre - Primary section Mrs. Shubhangi Kulkarni teachers & students were present for the occasion. Principal Mrs. Gairola, along with Co-ordinators Mrs. Banda & Mrs. Shubhangi Kulkarni performed the paid homage to our revered Founder. Our students presented some prayer songs –guided by our Music teachers Mr. Kuldeep Ghadge & Mr. Prathamesh Inamdar. C.C.A. –in- Charge Miss Swaleha Mujawar delivered a speech giving information about the life & work of Late Shri Shankarrao Bajirao Patil Sir. In her address to the students; Principal Mrs. Madhubala Gairola made students understand that it was not merely remembering people like Late Shri Shankarrao Bajirao Patil Sir or paying homage to them that matters; what is more important is that we try to learn & inculcate the humble & noble deeds & thought of such great She stated that after receiving education & more so – knowledge; it becomes the responsibility of the students to make a difference. It is not always that the name of our School or institution should be raised in propagandas & slogans all around –it should be our presence & behaviour that should reflect the ideals, practices & teachings imbibed by our School – that make it different from the others. If at one time thousands of S.B.Patilians devote themselves wholeheartedly, then a massive amount of task force would become readily available for the service of the society &nation; which would be the greatest & the most fitting tribute we could pay to our revered Founder Sir. Principal Mrs. Gairola guided the proceedings of the event. School Co-ordinator Mrs. Padmavati Banda & C.C.A. –in- Charge Miss Swaleha Mujawar arranged the proceedings of the event. 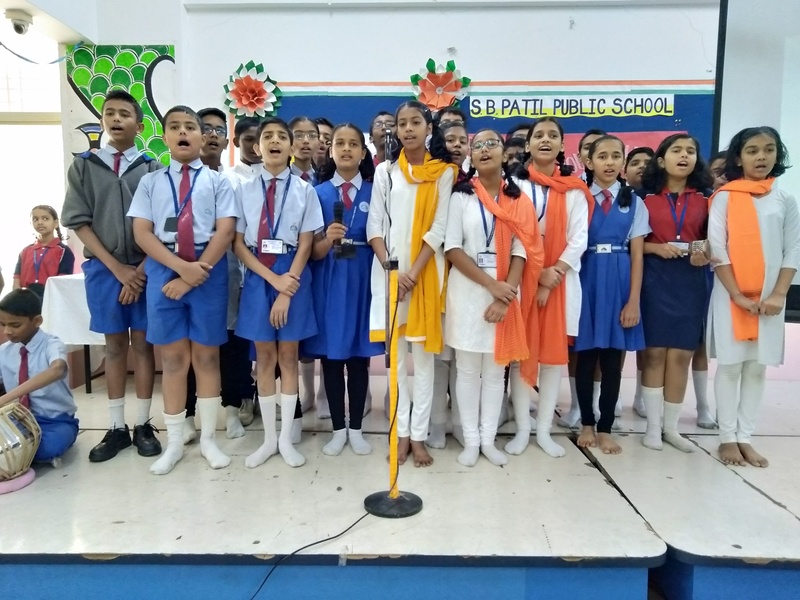 Mrs. Krina Gandhi, Mrs. Leena Varghese & students of Yellow House along with our Music teachers Mr. Kuldeep Ghadge, & Mr. Prathamesh Inamdar arranged the assembly for the day. Learning Outcomes: Students derived inspiration of service to society & sharing the wealth of knowledge & wisdom with fellow society members. 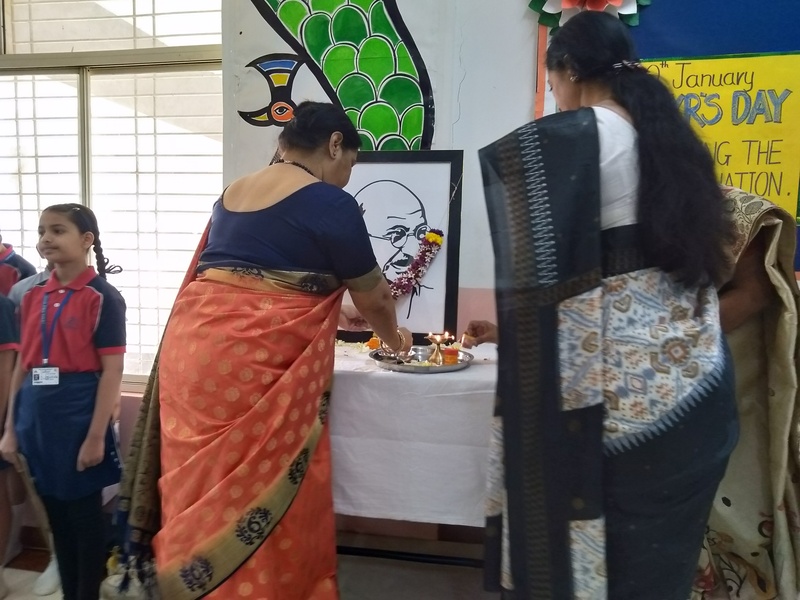 Pimpri Chinchwad Education Trust’s S.B.Patil Public School observed Tilak Punyatithi at its campus on the 1st of August 2018. The day was marked by a Special Assembly. Principal of the School, Mrs. Madhubala Gairola, School co –ordinator Mrs. Padmavati Banda, teachers & students were present on the occasion. The Assembly began by offering homage to the great leader at the hands of our Principal, School Co- ordinator, Head Boy Mast. Rudra Patil & Head Girl Miss Tanaya Ajgar. The Choir group presented a song highlighting the moral value of patriotism .An audio visual clipping was demonstrated, showing the life and work of the great leader. Student of Std II master Shaurya Mohite was present in the assembly dressed in the attire of Lokmanya Tilak. Principal Mrs. Gairola addressed the students about need to imbibe the values & great deeds which the lives of great people teach us .She remarked that observing death anniversaries or celebrating their birth dates is not sufficient – we need to learn what all these people have done and achieved ,that makes them great. She referred to a real life instance where lighting a match stick in the damp weather at times becomes difficult and if the surrounding is too airy – the flame fails to ignite. And here was a man who was out on a mission to ignite the slumbering minds of Indians about nationalism & social reformation; that too in the midst of the tormenting British Raj. Principal Mrs. Madhubala Gairola guided the proceedings of the event. Co- ordinator Mrs. Padmavati Banda organized the proceedings of the day. C.C.A. 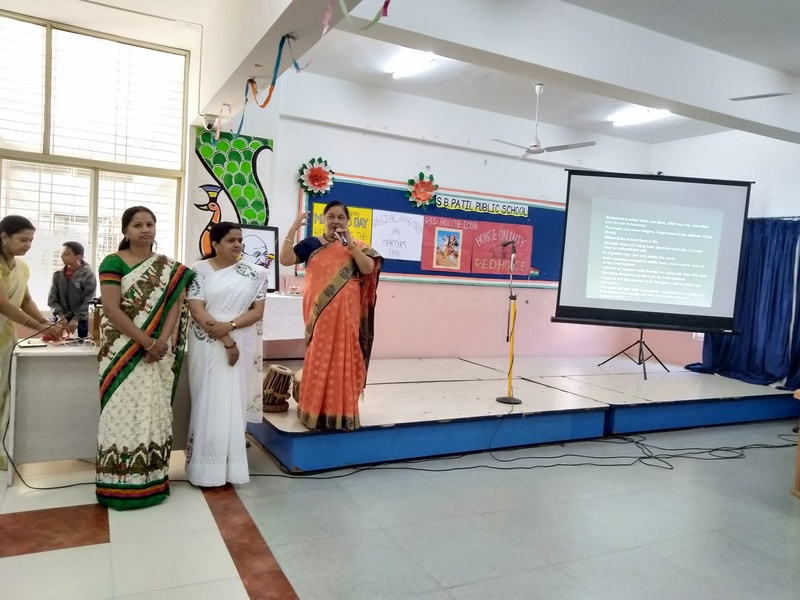 – in – Charge of the School, Miss Swaleha Mujawar, Green House Teachers Mrs.Nivedita Biswas, Mrs. Deepika Kannao, & Music Teacher Mrs. Sulochana Pawar conducted the Special Assembly for the day. Our School conducted a Special Assembly on the auspicious occasion of Guru Pournima at its Campus on the 27th of July 2018. Principal of the School, Mrs. Madhubala Gairola, Primary co –ordinator Mrs. Padmavati Banda, teachers & students of Std. VIII – X were present on the occasion. The Choir Group presented a song highlighting the significance of the occasion. Students of Std IX presented a short skit on the life of Swami Vivekananda – focussing on equality of all students before a Guru. Hindi & Sanskrit Teacher Mrs. Deepika Kannao elaborated upon the importance of obeying our Guru who is the Path – guides for our lives. She highlighted upon the legacy of the Guru- Disciple from our ancient past; and also co –related the same to the present Education System –stressing upon the fact that even if times have changes – the tradition of a student following his Guru is immortal. Principal Mrs. Madhubala Gairola guided the proceedings of the event. Co- ordinator Mrs. Padmavati Banda organized the proceedings of the day. Mrs. Krina Gandhi, Mrs. Prutha Vaidya, Mrs. Sulochana Pawar & students of the Yellow House conducted the Special Assembly for the day. Our S.B.Patil Public School celebrated World Environment Day at its campus. Principal of the School, Mrs. Madhubala Gairola, School Co –ordinator Mrs. Padmavati Banda, all teachers & students of Std. VIII – X were present on the occasion. A Special Assembly was conducted to mark the occasion. Our students Master Rutwik Bhondwe & Master Ayush Bodke of Class IX gave information & also presented an A- V Presentation about Saving the Environment, elaborating upon the concepts of pollution, environmental degradation and the drastic changes occurring in the natural resources. 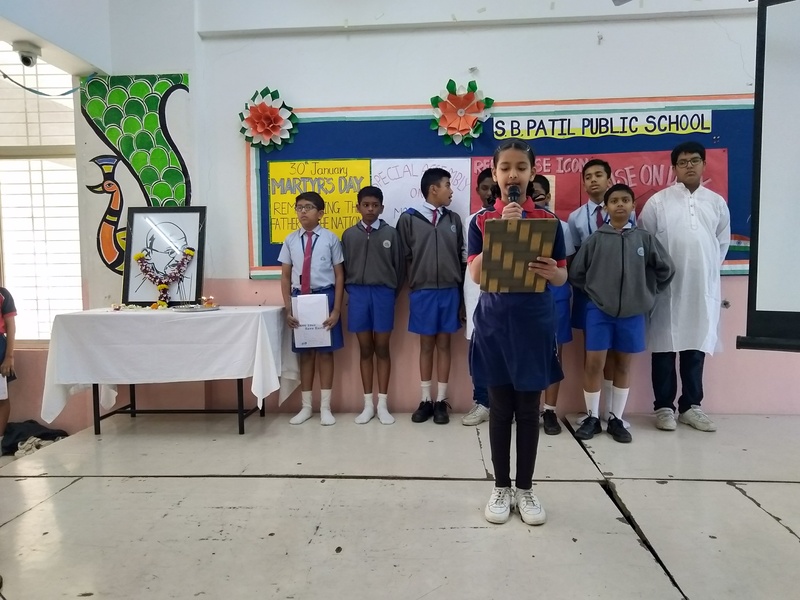 Students of Std VIII & IX; Miss Meghana, Miss Ruchita Shinde, Master Shardul & Master Rutwik Bhondwe presented a skit on the issues of saving our living planet, not wasting natural bounties like trees- forests etc. Principal Mrs. Madhubala Gairola guided the proceedings of the event. Co- ordinator Mrs. Padmavati Banda organized the proceedings of the day. Mrs. Darshana Kamat, Mrs. Rachana Sisodiya & students of the Green House conducted the Special Assembly for the day. Learning Outcomes: Students learnt value of concern for environment by connecting with it.